A snapshot of the sculpture of Victoria with the Queen Victoria Building in the background — the start of today's journey. We're nearing the end of our trip to Australia. For nearly two weeks we've made our way up the country's east coast, starting in Sydney and then going to Byron Bay, the Sunshine Coast, and Cairns. We've slept in camper vans, hiked along beaches, searched for koalas, and tread the hallowed ground of Steve Irwin. We've snorkeled along the Great Barrier Reef and even spotted a family of clown fish near their precious anemone. Google "Gallipoli" and the number three result is the 1981 film starring a young Mel Gibson when his Aussie accent was still strong. The campaign continues to figure prominently in Australian culture, regularly serving as the subject of films and books. Most recently, Russell Crowe starred in The Water Diviner, where he played a farmer searching for three missing sons who fought in Gallipoli. For our last few days in Oz, we're back in Sydney. And today while Stephen had a few photography meetings, I wandered through the Queen Victoria Building. I was struck afresh by the deep significance that Gallipoli and the First World War continues to hold for Australians. A shop dedicated entirely to toy soldiers made its Gallipoli collection the showpiece in its shop window. And when I wandered through the ABC Shop (a media store not a liquor outlet, Alabama friends), at least half of their limited selection of nonfiction books were dedicated to Gallipoli and experiences related to it. For some context, the Gallipoli Campaign was carried out by the Australian and New Zealand Army Corps (ANZAC forces) in April of 1915, when the British decided they would try to weaken Nazi power by attacking their allies. In an attempt to overthrow the Ottomans, the ANZAC and British forces attached Turkey in concert with the French. Their efforts met with disastrous results. More than 8,000 Australian soldiers (nearly 400 of them officers) were killed before the troops were evacuated in December. Despite the failure, the event became a historical and cultural turning point for Australians, serving as a defining moment in making them their own nation as opposed to a colony of Britain. Stalwart khaki-clad forms with their broad-brimmed hats, sleeves rolled up revealing burnt brown arms stroll about awaiting the arrival of train-loads of baggage, foot, etc, from Cairo, to be stacked on carts and hustled off to the camp... A sharp “Keep off that,” brings understanding of intention if not of words. These are the men “on duty;” on the opposite side of the line are seen the crowds of “off duty” men awaiting the train to Cairo and amusements. While the English-language paper gave a celebratory report, the arrival of the ANZACs was more trying for Cairene Egyptians. One Ma'adi home was converted into a hospital for the troops — a site continually challenged by miscommunication and cultural clashes with Egyptian servants. Soldiers were regularly reprimanded for harassing the nearby villagers. Tensions between the soldiers and locals erupted in April 1915 — just as the ANZACs were being about to leave for Turkey — when a riot broke out in Cairo's brothel district. * For Egyptians, these events fueled anti-British sentiments and helped grow popular support for the nationalist movement. What had not occurred to me until now, however, was that these conflicts between the Egyptians and Australians in Ma'adi and throughout Cairo participated in the making of two nations, not one. The First World War broke down the prestige of the British Empire for not only the Egyptians, but also the Australians, even as they were being called upon to actively fight for it. Did the Australian soldiers sense their weakness and vulnerability in the face of the upcoming battle? Was there a frustration that fueled their unruly behavior — a sense that they needed to rebel in some way against this European war? Being here in Sydney now sheds new light on the sliver of ANZAC history that I covered in my research sheds. Two nations in the making as two empires—the British and the Ottoman—faltered. I did not come to Australia for research or work, yet I find myself impressed and humbled by the ways in which global history lessons continue to surround me. *For more on Cairo's 1915 riot see Mario M. Ruiz, "Manly Spectacles and Imperial Soldiers in Wartime Egypt, 1914-19," Middle Eastern Studies, 45:3 (May 2009), 351-371. The Southern Spotlight story on the Inn at Little Washington from the March/April issue of Southern Lady. Photos by Stephen DeVries. About a year ago, Stephen and I went to the Inn at Little Washington for Southern Lady. We pulled into a small crossroads of a town, just east of the Shenandoah Valley, and I didn’t quite know what to expect. I had heard stories of lavish interiors and extraordinary food. The town itself, however, gave the impression of quaint, yet idyllic Americana. A small downtown, a kind of village, really, with beautifully manicured window boxes and gardens, and board-and-batten exteriors in stately greens, blues, and reds—colorful, yes, but not overbearing. As we got ourselves situated, the chef and proprietor himself, Patrick O’Connell, helped get our bags into our room. Stepping inside, the interiors dripped with an unexpected degree of luxury. Beautifully patterned fabrics lined the walls and draped in billows from the ceilings. Monkeys danced in the bar room wallpaper—indicative of a whimsical playfulness at work throughout the place. In working on the story about this wonderfully peculiar locale, I got an unexpected lesson on the meaning of place and how valuable it is to feel at peace with your surroundings and then share that with others. O’Connell first came to this part of Virginia as a child. His family would go on road trips from D.C. to the Shenandoah Valley, and Washington (known as “Little Washington” to differentiate it from the busy capitol) fashioned itself as a roadside stop. Its two main streets were peppered with service stations. In fact, O’Connell’s well-appointed inn was previously a tire shop and gas station—something hard to imagine today. The way O’Connell explains it, this little town—the first place in the United States named after our first president—held special meaning for him. It became a part of him, and, in turn, he left an indelible mark on it. O’Connell and Little Washington became two parts of a whole. He started with the restaurant in the former service station, always envisioning expanding to create a larger inn. He then added he surrounding pasture land, and shops down the main street. Last year, they created a parsonage across the street from main inn. For O’Connell, making the Inn at Little Washington meant celebrating the best that the area has to offer, and offering it to others as an immersive experience. Not everyone has the kind of all-encompassing vision that O’Connell possessed when he embarked on the creation of his inn—an endeavor that has taken nearly 40 years. From the intricate flavors of his food to the decorative details of the interiors, each piece speaks to an imagination paired with great ingenuity. The experience also speaks to the power of place. Geographer Yi-Fu Tuan argues that a place comes into being through experience and familiarity. It is deeply personal. Yet those gifted in hospitality have the ability to offer their experiences to others, and craft a meaningful place to the uninitiated. Not everyone can stand among the rolling hills of Virginia and see the possibilities realized at the Inn at Little Washington. Yet the power of one person’s especially strong understanding of that area can make a special experience available to guests. I have no ambition to own an inn or open a restaurant. Hearing O’Connell’s thoughts on the power of place and seeing his ability to present his enjoyment of the area to travelers, however, does inspire me let an air of hospitality speak through the places I have the ability to create. Stephen and I bought a home just before Christmas last year, and we have since set out to make it our own. More than that, though, I am learning from the South’s sanctuaries of hospitality, that in crafting a place for us, I also have the opportunity to invite others in to enjoy the love and happiness that allowed us to make a home in the first place. For more on the Inn at Little Washington, see the story in Travel South, Southern Lady's new travel special edition. 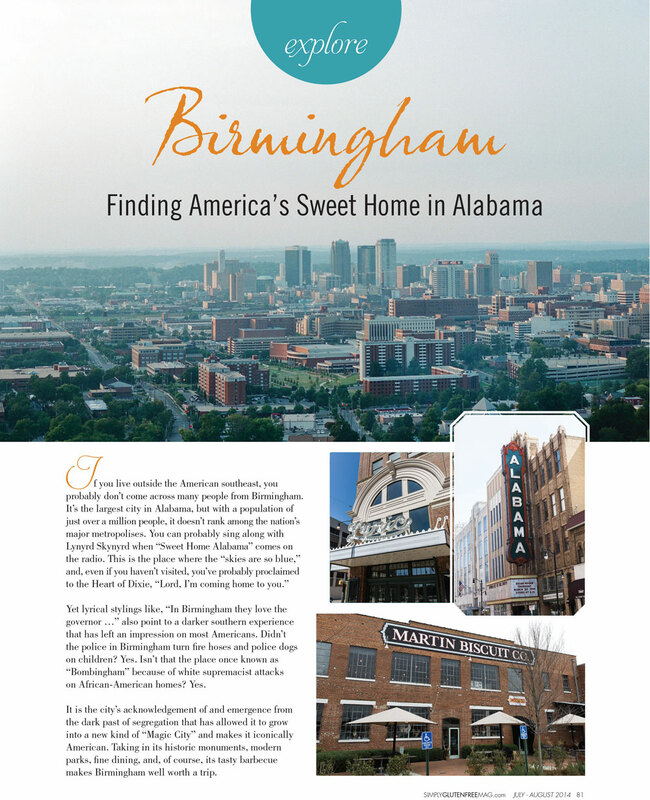 Opening spread of the story on Birmingham for Simply Gluten Free. Photos by Stephen DeVries. Whether I care to admit or not, celiac disease has come to define much of my travel experience. For the most part, this has translated into an unexpected blessing. I seek out local spots that can accommodate my diet, often finding unexpected treasures on the road. There's also a certain joy to finding an unexpected gluten-free treat in a new place. On our trip to Boston this spring, for instance, as we trekked along the Freedom Trail, we happened to come across a bakery with gluten-free cupcakes and cookies. After watching the rest of my family partake in some delicious-looking Dunkin’ Donuts earlier that day, it was a special kind of joy to find my own baked treat without having to plan for it. Even with these happy discoveries and little surprises, arriving in a new place as a gluten-free traveler also poses a certain number of challenges that can create some serious anxiety. While I have increasingly grown accustomed to asking for special service, even after living gluten free for 12 years I'm still not altogether comfortable with it. I have watched my own moments of uncertainty and shyness cause anxiety not only for me, but also for my fellow travelers. Add a few growling stomachs to the mix and you have a recipe for a travel disaster. Those less optimistic experiences made writing a travel story about Birmingham for Simply Gluten Free magazine a special privilege. By discussing my favorite places to go in the place I call home, hopefully I gave readers the inside track on where to satiate their hunger and enjoy the city at the same time. In my view, the best parts of Birmingham aren't located near the chain restaurants and their alluring familiarity. It's a city that is best experienced and understood through a stroll downtown, where one can take in the Birmingham Civil Rights Institute, the parks, and grab a bite to eat while appreciating the depth of history that took place on the sidewalks you're treading. While the city's growing food scene provides a wide range of culinary options for anyone to enjoy, since most of the fare is local, it can be intimidating if you haven't done your homework. Writing the story meant something special to me for that reason. It allowed me to talk about the city that I love and the wonderful places to eat, proving that gluten-free diners can enjoy the comforts of the South even if they can't eat traditional biscuits and gravy. I've posted my complete story for Simply Gluten Free with the rest of my writing. For those of you interested in a my favorite places to grab some gluten-free grub in Birmingham, below I’ve listed the restaurants and cafes I like best according to their neighborhood. El Barrio Restaurante Y Bar - My favorite Mexican restaurant in town. They can prepare most menu items gluten free. I’m an especially big fan of their tacos, which you can order with homemade corn tortillas. Their queso, with its blend of goat cheese and tequila, is also not be missed. Paramount - A great spot for a fresh take on American bar food classics. They have a delicious chili, and a Frito pie, both of which pair perfectly with an Original Sin Cider and some good company. Make sure to check out the back of the restaurant, where they have old-school arcade games and ski-ball. Urban Standard - Among the best coffee shops in town, they also serve breakfast, lunch and dinner. Their staff are friendly and know how to accommodate gluten-free diners. I would especially recommend their chicken salad on greens. Highlands Bar & Grill - With a James Beard Foundation Award winning chef, this fine dining experience combines French culinary tradition with locally farmed ingredients. While they don’t have a specifically gluten-free menu, their knowledgable staff will carefully walk you through the menu and ensure you have a gluten-free experience. Jim ’n’ Nicks Bar-B-Q - One of our favorite southern BBQ joints, their meats, sauces, and a good handful of their sides are all gluten-free. Ask a waiter, and they’ll make sure you don’t veer into glutenous territory. Rojo* - This is one of our favorite spots when going out for lunch or dinner. Rojo combines American and Mexican food for a menu that can please just about anyone. They have a gluten free menu (look on the shelf below the regular menus), and if you have celiac, let them know and they’ll change gloves and do everything they can to avoid cross-contamination. Silvertron Cafe - This Birmingham staple has been delighting locals for more than 25 years. On a recent visit, I asked the waiter about gluten-free options and he had the owner Marco Morosini come to our table and walk me through the menu. Marco continued to check in on us throughout the evening, to ensure that the meal went well. It did, and it’s on its way to a dining-out go-to for us. Urban Cookhouse - This is a lunch favorite of mine. Most of their menu items can be prepared gluten-free. Their grilled chicken is among my favorites. They also make a delicious lemonade. They have two additional locations—one in Crestline Village and another in the Summit—making their locally sourced food easily accessible wherever you happen to be. O’Carr’s - Best known for its chicken salad, O’Carr’s prides themselves in creating delicious and beautiful food that is as colorful as it is tasty. If you’re looking for a gluten-free caterer, O’Carr’s would be my first stop. Owner Cameron Carr pulled out all the stops to make sure that we had a completely gluten-free menu at our wedding in 2012. Church Street Coffee & Books* - Their cozy atmosphere, well-curated book collection, and delicious coffee are enough to make Church Street my favorite coffee shop in Birmingham. Add in the range of gluten-free treats in their pastry case, and the place can't be beat. (If you're with gluten-eating friends, make sure they indulge in a "Break-up Cookie." I have it on my husband's expert authority that they're the best choclate-chip cookies in town). Over Easy - A great breakfast and brunch spot. Their omelets are my favorite. You don’t even have to skip the toast here! They have gluten-free bread and make sure it’s toasted without fear of contamination. Ollie Irene* - My favorite spot for fine dinning in Birmingham. Ollie Irene clearly marks their gluten-free options on their menu, and offer several options from appetizers, through the mains and on to desserts. Their seafood is among the best in town. Funky Muffin Bakery* - Birmingham’s 100% gluten-free bakery, the Funky Muffin creates just about any baked good you can think off. Their donuts and cinnamon muffins are especially good. They also do custom cakes and other orders, making them ideal for a gluten-free celebration. It is definitely worth the trip south of town to check them out. Last summer Stephen and I made our way through Africa and into southern Europe. I posted before about some of our experiences after landing in Kigali and making our way through the twists and turns of Rwanda's mountains to Goma, DR Congo. That was just the beginning of our three-week venture, as we went from the Congo to Kenya, and then to Italy. We ended the trip on a high note, especially where food and friends were concerned, and spent a few days in Barcelona, Spain. We wandered through the city, with all of its layers of medieval and modern influences, escorted by our friends Kat and Alex (who thankfully speaks Spanish and Catalan). The four of us sampled an array of seafood, took in the architectural stylings of Gaudí, and took a train ride into the mountains to tour the monastery at Montserrat. The trip also paved the way for a national travel story. This month, you can read about our Barcelona experience in Simply Gluten-Free Magazine. While the story emphasizes those elements of our trip that catered to gluten-free dining (something quite easily managed in Spain), it also talks about the variety of attractions that draw so many travelers to the city. Now we're in the midst of a new three-week journey from New England and through the Mid-Atlantic. It seems like the perfect time to pause and reflect on the places we've journeyed to in the past year. Here's a sampling of our tear sheets. Photos by Stephen DeVries. As a historian, you hope for that moment when your path through the archives will intersect with your subject in some meaningful way. You want to find a place, an experience, a sense of understanding that helps bring the past more fully to life. When those connections to the past catch us off guard, when they are less expected, less sought after, however, they should give us pause. Questions regarding how a particular place came into being and what circumstances allowed it to take that form have drawn me back to our time in Africa last summer. After our stay in Nairobi, we went on safari in Masai Mara. Here are a few pictures taken by Stephen DeVries. I recently read Caroline Elkins' Britain's Gulag: The Brutal End of Britain's Empire in Kenya, which relates the extremely violent behavior of the British in Kenya, particularly the white settlers, as their position of dominance in the country declined following World War II. I traveled to Kenya for the first time last August. It is my husband's favorite destination, and we made a point of going there together soon after we were married. When we arrived in Nairobi, Stephen's friends arranged for us to stay in the United Kenya Club — and here is where my path intersected with the events that Elkins describes. The United Kenya Club was founded by Tom Askwith, who established the social club complete with a library, hotel, restaurant, and bar in hopes of creating Anglo-Kenyan partnerships that crossed racial boundaries. Askwith established the club in 1948 and served as its first president. His vision for interracial partnership, however, failed to abate the violence perpetrated against the Kikuyu of Kenya's Central Province. Worse still, his belief that detention camps might be used for the re-education of the imprisoned and tortured Kikuyu was deployed by the government as a public relations front for their brutal tactics. Why were these supposed rebels being detained in prison camps without any formal charge? Well, because they had to be trained in how to be properly civilized, and freed of their "savage" ways — or so the logic went. While Askwith did not have a direct hand in the violence, the camps remained sites of ongoing persecution while the government paid lip service to Askwith's hopes a more peaceful, socially cohesive future. When I read Askwith's name in Britain's Gulag something came full circle for me. The United Kenya Club remains a reserve for today's political elite in Kenya. While it was a hospitable and comfortable place to stay, something about it also felt dated or perhaps out place to me. When I first saw Askwith's name at the top of its list of presidents last August, I knew it had colonial roots, but I didn't understand what they might be. Even after learning more about Askwith's career in Kenya, the tension didn't exactly resolve. Here was a man who did not directly participate in the torture of the Kikuyu, yet he knew about it and didn't mount any significant opposition. Perhaps he hoped that it was a means to an end in achieving his vision for interracial harmony. Now his club remains, but is that because of or in spite of him? Retrospectively, the United Kenya Club gained the kind of meaning I might have searched for in the archives, yet on different terms. I was a tourist in Kenya, privileged to get to stay in this club because of my husband's friendships. What does it mean that I could access this place in 2013, as an American tourist married to someone who has done extensive nonprofit work in the country? What does it mean that the club remains the reserve of an elite, although now one predominantly African? And what of that founding message of interracial harmony, which lost its urgency as most of the white settlers in Kenya left the country decades ago, often making homes in South Africa? I don't have ready answers to these questions. Perhaps the most significant point is the ongoing existence and use of this building in profoundly altered circumstances. Does it memorialize Askwith as an awkward testimony to his own incomplete vision for breaking down social barriers? Did in succeed in spite of the paternalism of his vision? It is not necessarily profound that my feet crossed paths with Askwith some 50 or 60 years removed. Everyday in Birmingham I walk the same sidewalks as the foot soldiers of the Civil Rights Movement. I do not pretend to access the experiences of the past through these common paths. Yet those former footprints shaped the places we inhabit today in uneven, complex, and sometimes confusing ways. Can we really understand the places we inhabit today if we don’t know how they came into being?